Find hotel near Saint George Maronite Cat .. 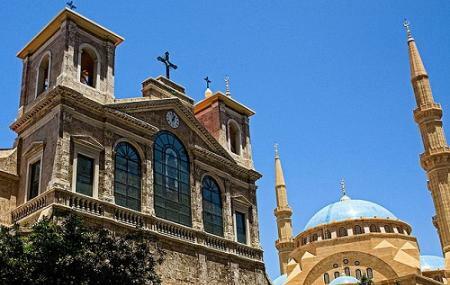 The Saint George Maronite Cathedral, Beirut is one of the most important tourist destinations of Lebanon. The interior of this significant church is Basilica di Santa Maria Maggiore. The architecture of the church carries the Neoclassical architecture style. Stucco and marble are the elements that get used to decorate the walls of the church. Located in the downtown area of Beirut, this church is truly a delight for the eyes. Your camera would have a lot of scope to get great clicks. This huge church offers a wonderfully peaceful ambience. You can sit here for a long time to enjoy pure calmness and relaxation. To personalise your visit to the city, you can use an all-inclusive Beirut trip planner for the same that will give detailed information about visiting the city. You can add cozy hotels in Beirut like Ramada Beirut Downtown, Beverly Hotel Beirut and Residence De France. Create your own Beirut vacation packages or choose from the ones made by travel experts. Also explore the best ways for how to reach Beirut. Fabulous Cathedral in down town beirut , similar interior decoration as Maria Magiore Basilica Rome.